Indian on Thursday fondly remembered the former Prime Minister Indira Gandhi on her 29th death anniversary. Congress President Sonia Gandhi and party Vice President Rahul Gandhi were present in the function at 24 Akbar Road to pay tribute to the departed leader. Earlier, President Pranab Mukherjee, Prime Minister Manmohan Singh, Congress President Sonia Gandhi and her son Rahul Gandhi paid floral tributes to the late leader at her memorial 'Shakti Sthal' on the banks of river Yamuna. Nation remembers former Prime Minister Indira Gandhi on her 29th death anniversary. Congress President and UPA Chairperson Sonia Gandhi paid tributes to the departed leader at Shakti Sthal. Congress President and UPA Chairperson Sonia Gandhi and the Prime Minister Dr Manmohan Singh attended the Dussehra celebrations at the famous Ramlila maidan. The leaders shot the arrows at the effigy of Raavana at the function in Ramlila Grounds. Tens of thousands of people converged on this occasion to witness one of the biggest commemorations of Dussehra at Delhi's popular Ramlila Maidan and Subhash Maidan. Sonia Gandhi greeted the people on Dussehra and wished that the festival brings peace, prosperity and progress throughout the country. Dussehra was celebrated with deep fervour and enthusiasm in different parts of Delhi and in other parts of the country on Wednesday. Congress President and UPA Chairperson Sonia Gandhi alongwith President Pranab Mukherjee, Prime Minister Manmohan Singh and witnessed the burning of the effigy of Ravana, symbol of evil, at the Dussehera celebrations Wednesday at Subhash Maidan near the historic Red Fort in Delhi. Sitting on an embellished dais, the leaders watched the spectacle of fireworks and the burning of effigies of Meghnad and Kumbhkaran - son and brother, respectively, of Ravana - before the effigy of the demon-king was set alight. Congress President and UPA Chairperson Sonia Gandhi accompanied by her daughter Priyanka Gandhi Vadra, laid the foundation stone of an ambitious rail wheel manufacturing unit in Lalganj at Raebareli. This factory will be the biggest of its kind in the country. The unit will come up within the coach manufacturing unit already functioning in the region. “We know that employment generation is possible only if there is progress. Development takes the country forward and brings positive changes in our life. I hope that this factory also will play a big role towards development of this region” said Sonia Gandhi while addressing the gathering. “You have watched closely the efforts of Indira Gandhi and Rajiv Gandhi for the development of this region. Welfare of the people and development of the country were supreme for them. Their vision was to build up a bright future while improving the present situation. We also must follow their footsteps. I want to tell this, mainly to the youth here, because they have a bigger role in the nation building” reminded the Congress President. While listing out some of the important legislations of the Congress-led UPA government at the Centre, Sonia Gandhi said, “We had promised Food Security Bill and despite all the obstacles, troubles and hindrances, we could get the bill passed in the Parliament. This will benefit 75% of the rural and 50% of the urban population” and added “At present Centre gives about 66 lac tonnes of food grains to Uttar Pradesh; after the implementation of this Food bill state’s share will be increased to 96 lac tonnes. 80% of the rural and 60% of the rural poor will thus be able to avail food grains at subsidized rates in this state. This shows that Uttar Pradesh will get the maximum benefits from this law, compared to other states”. “We have always made it a point to give priority to the issues related to the farmers” asserted Sonia Gandhi and continued “The UPA Govt, for the first time, increased the MSP of other food-grains also, apart from wheat and rice. The most important measure, for the benefit of the farmers, is the historic Land Acquisition Bill, passed by the Centre. Now, nobody can forcibly grab the lands of poor farmers. Further, it is now mandatory that the lands can be acquired only with the consent of the farmers and after paying the adequate prices”. RINL and Indian Railways have entered into an agreement for setting up a forged wheel plant at Lalganj with an investment of Rs.1,100 crore in the first phase. The project promises about 600 jobs while 2,000 others would benefit indirectly. The railways will lease 40 acres to the RINL for 30 years to set up the factory. The factory will produce one lakh forged wheels each year to cater to the demand of LHB coaches and high-speed locos. Once set up in 42 months, it would curtail imports of forged wheels, besides enhancing the safety aspects of locos, coaches and wagons. The railways have assured an offtake of 1 lakh wheels from the RINL for 26 years. This (rail wheel) project is another step towards development and once this factory is completed it will not only cater the needs of the rail coach factory already here but also will meet the requirements of the entire northern railway. The UPA Government at the Centre has been taking various measures for all-round development in the country and this factory is another example for our commitment. We know that employment generation is possible only if there is development. Development takes the country forward and brings positive changes in our life. I hope that this factory also will play a big role towards development of this region. There is no end of responsibilities and continued efforts in our life; and similarly there is no end of efforts for development. Our great leaders built this nation believing in this concept. Congress President and UPA Chairperson Sonia Gandhi accompanied by her daughter Priyanka Gandhi Vadra, laid the foundation stone of an ambitious rail wheel manufacturing unit in Lalganj at Raebareli. This factory will be the biggest of its kind in the country. The unit will come up within the coach manufacturing unit already functioning in the region. “We know that employment generation is possible only if there is progress. Development takes the country forward and brings positive changes in our life. I hope that this factory also will play a big role towards development of this region” said Sonia Gandhi while addressing the gathering. Lucknow: Congress President and UPA Chairperson Sonia Gandhi on Tuesday laid the foundation stone of Uttar Pradesh's first All India Institute of Medical Sciences complex in her parliamentary constituency, Raebareli. Sonia Gandhi, accompanied by her daughter Priyanka Gandhi Vadra, performed "bhoomi pujan" near old sugar mill at Munshiganj after which construction work for the building has begun. The project is estimated to cost Rs 1,000 crore. The Congress President also visited the District Agriculture Science Centre and launched Tata Consultancy Services' (TCS) training programme. Sonia Gandhi later laid the foundation stone of city resource center of housing and urban poverty alleviation ministry, to be constructed by HUDCO. She also met a girl - 17-year-old Renu - treated by the Smile Train, which provides free cleft and palate treatment across India, at SimHans hospital at Gora Bazar, and enquired about her health. Congress President and UPA Chairperson Sonia Gandhi visited her Parliamentary constituency Raebareli on Tuesday along with her daughter Priyanka Gandhi Vadra. The Congress President in the morning laid foundation stone of city resource centre of housing and urban poverty alleviation ministry at Gora Bazar. She also laid the foundation stone for an AIIMS in Munshiganj area. 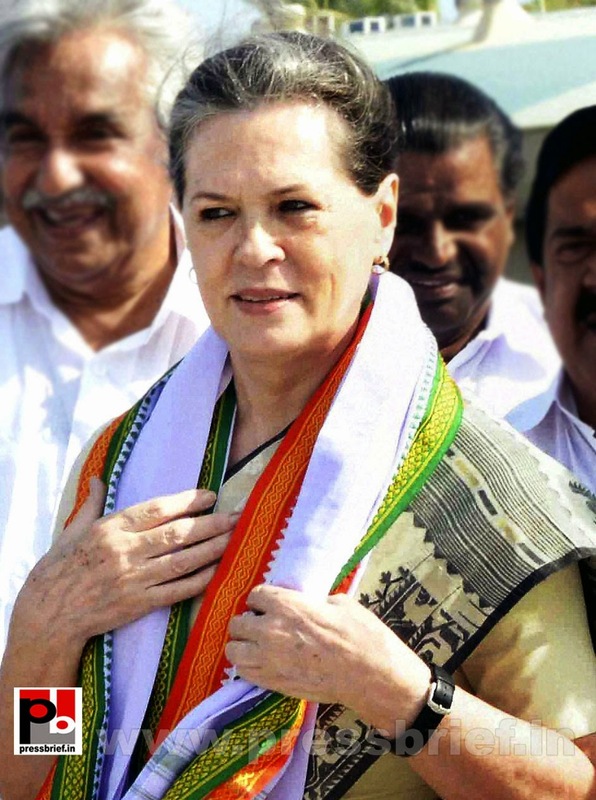 Sonia Gandhi later presided over a meeting of the central vigilance and monitoring committee. After this, Sonia Gandhi met a girl treated by the Smile Train, which provides free cleft and palate treatment across India, and also interacted with the youths getting training at an Agriculture Science Centre. In the afternoon, the Congress President laid the foundation of rail wheel factory to be set up by SAIL near the Rail Coach Factory(RCF) at Lalganj. Congress President and UPA Chairperson Sonia Gandhi accompanied by her daughter Priyanka Gandhi Vadra, laid the foundation stone of an ambitious rail wheel manufacturing unit in Lalganj at Raebareli. This factory will be the biggest of its kind in the country. The unit will come up within the coach manufacturing unit already functioning in the region. "We know that employment generation is possible only if there is progress. Development takes the country forward and brings positive changes in our life. I hope that this factory also will play a big role towards development of this region" said Sonia Gandhi while addressing the gathering. 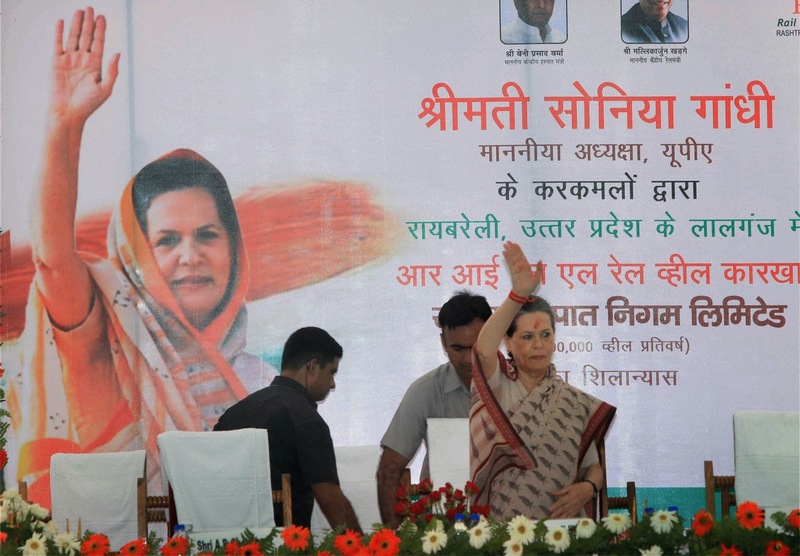 Congress President and UPA Chairperson Sonia Gandhi addresses the gathering after laying the foundation stone of of a rail wheel factory in Lalganj at Raebareli, her parliamentary constituency. Sonia Gandhi with Priyanka Gandhi lay the foundation stone of the rail wheel factory in Lalganj, Raebareli. Sonia Gandhi also laid the foundation stone for the first AIIMS in Uttar Pradesh at Munshiganj. Congress President and UPA Chairperson Sonia Gandhi visited her Parliamentary constituency Raebareli on Tuesday along with her daughter Priyanka Gandhi Vadra. 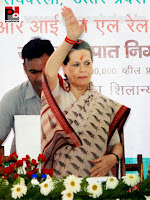 Sonia Gandhi laid the foundation stone for an AIIMS at Munshiganj in the constituency. Later in the day the Congress President laid the foundation of rail wheel factory to be set up by SAIL near the Rail Coach Factory(RCF) at Lalganj. Congress President and UPA Chairperson Sonia Gandhi visited her Parliamentary constituency Raebareli on Tuesday along with her daughter Priyanka Gandhi Vadra. Sonia Gandhi with Priyanka met a girl treated by the Smile Train, which provides free cleft and palate treatment across India, and also interacted with the youths getting training at an Agriculture Science Centre. Nation fondly remembered Mahatma Gandhi on Tuesday with President Pranab Mukherjee leading the nation in playing glowing tributes to the Father of the Nation on the occasion of his 144th birth anniversary.Pranab Mukherjee, Vice President Hamid Ansari, Prime Minister Manmohan Singh, Congress President Sonia Gandhi were among the prominent people who visited Gandhi's memorial at Rajghat to offer floral tributes. New Delhi: Congress Presidentg and UPa Chairperson Sonia Gandhi addressed a massive Congress rally in Karnataka’s Mandya region where she thanked all the people and the Congress workers for giving a huge mandate to the Congress party in the assembly and the recently concluded Lok Sabha bi-election. Sonia Gandhi also expressed her support for the Prime Minister and said that the entire Congress party stands behind him as it was under his leadership the UPA Government at the Centre implemented all the welfare policies. Slamming the opposition, the Congress President quipped, “They may make fun of the prime minister but I want them to know that the whole party is behind him". Taking a dig at the opposition – mainly the Bharatiya Janata Party, Sonia Gandhi reiterated that Congress is not afraid of any party. "We are not afraid of the BJP or any other opposition party. We will continue our sincere efforts for the people of Karnataka and the people of the whole country," she asserted. “Last time I was here during assembly elections with a request to give Congress a chance. The people of Karnataka put the trust on the Congress party once again a huge mandate to us and I thank all of you for that and also the Congress workers – the men and women- for their hard work” said Sonia Gandhi. “I am confident that the Congress government in Karnataka will respond to the raising aspirations of the people in the state. 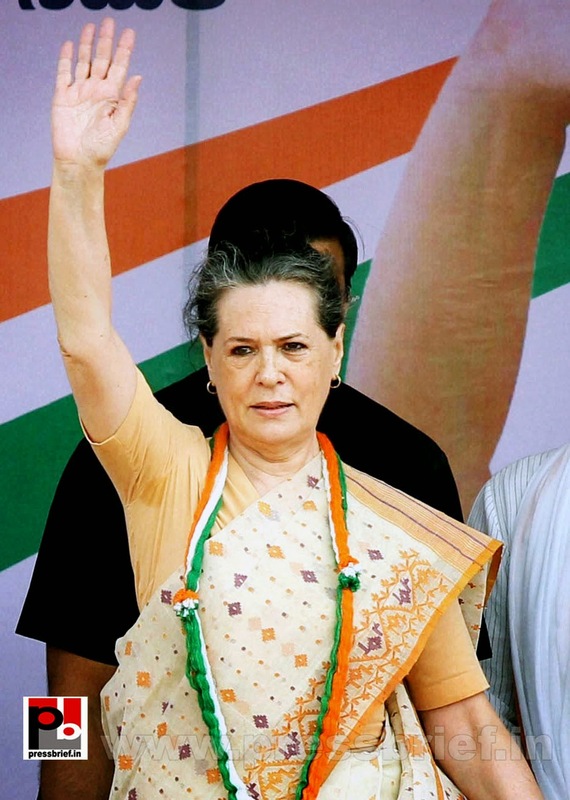 Our government will deliver on the promises made to the people” said Sonia Gandhi. Praising the Congress Government in the state, Sonia Gandhi spoke about Karnataka government's Anna bhagya scheme (food security to BPL). She claimed that the state government has fulfilled all the promises made in the poll manifesto. The Congress President also referred to the food security bill and land acquisition bill brought in by the UPA Govt at the Centre. Sonia Gandhi asserted that UPA's land acquisition bill will work as safeguard to farmers of the country. More than two lakh people had attended the meeting. Former chief minister SM Krishna, Chief Minister Siddaramaiah and KPCC president Dr. G Parameshwar were also seated on the dais.